Info Match your gyroid up with the outline. Gyroid Jumble is one of Dribble and Spitz's microgames in WarioWare: Twisted!. The player controls a gyroid tilting the system, and they have to line up their gyroid with the matching outline, which usually vary between facial expressions and arm placements. The player must press The A Button to join the gyroid and the outline. 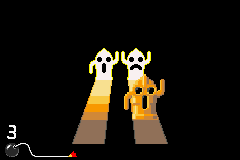 If the correct outline is picked, the gyroid and the other outline wave their arms up and down. If it's incorrect, the gyroid hits the outline and falls to the ground. 1st level difficulty: There are two outlines to choose. 2nd level difficulty: There are three outlines to choose. 3rd level difficulty: There are four outlines to choose. The Gyroids present in the microgame are objects from the Animal Crossing series. This page was last edited on October 29, 2018, at 21:26.